While my own kids no longer fit into the baby category, they still enjoy using Childs Farm products, which we have been using since they were babies. Joanna Jensen, Childs Farm founder, has started creating beautifully fragrant & naturally nurturing products for babies & children long before organic & natural beauty became the popular buzzwords to be thrown around. As mother, I trust Joanna, a mother of two herself, & her products to keep the young generation happy & bubbly & so I always keep an eye on brand’s new launches. Recent new additions to the product range include Biodegradable Baby Wipes & Biodegradable Wipes for toddlers & young kids, alongside the Sensitive Scalp Shampoo, all of which have been met with thumbs up from my young consumers of beauty products. Childs Farm sensitive scalp shampoo is un-fragranced and contains Salicylic Acid, which helps to gently exfoliate dry, flaky scalp skin, then soothes and calms it. Salicylic Acid, which comes from Willow Bark, is the principal ingredient in aspirin, and has been used since Roman times to relieve pain and inflammation. It works by removing loose and dead outer layers of the skin, and occasionally does give a tingling feeling to the scalp. It also has natural anti-inflammatory properties. This shampoo doesn’t smell like all the other CF shampoos, but I find that using it occasionally helps to keep my children’s scalps ‘healthy’. Recently I was having a conversation with my hair colourist & complaining about my own occasional scalp dryness, so she talked to me about some lifestyle and dietary changes, but also mentioned that using Head & Shoulders shampoo once a week will help to keep my scalp healthier, by getting rid of the ‘top’ dead skin layer & making my scalp & as a consequence hair, healthier. Like all Childs Farm shampoos, the sensitive scalp shampoo contains coconut derived surfactants and cleaning agents, as well as moisturising Argan Oil, and of course Salicylic Acid, the he levels of which are appropriate for use on babies & children. Remembering that piece of advice I swapped H & S for this shampoo & it actually works nicely, making this new addition to Childs Farm helpful not just for children’s scalps, but grown-ups too! In the context of kids haircare, I also want to mention an ‘old favourite’ of mine, Childs Farm Hair Detangler, which is a now not-so-secret tool in our home haircare arsenal, as it also contains tea tree oil, a known head-lice deterrer. Sadly those pesky, tiny creatures get an unwelcome mention in many schools newsletters – touch wood, my kids never had head lice & I credit Childs Farm for that!). Babies bums get mucky and the job of cleaning them up become more complicated when you travel & don’t have access to clean running water, when the nappy has been on for a few hours. 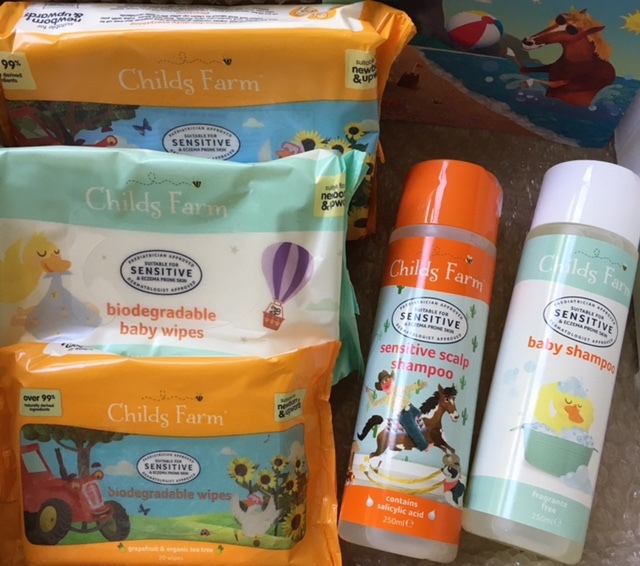 True to form, Childs Farm has developed baby bum wipes which help clean up all sorts of messes and leave babies skin clean & moisturised. Considering the competitive price, as well as the fact that those wipe are gentle & contain ingredients that are natural & have been dermatologically tested, I hope you will consider buying those wipes for your children, as opposed to Pampers & Johnson & Johnson that you purchase at the supermarket during your weekly shop. It also has to be said that I give Childs Farm products to friends with new babies, as I think it helps to start looking after babies delicate skin with the right type of products from the beginning, particularly when statistics show that more & more babies are born with sensitive & eczema prone skin. Everyone gets grubby hands, faces & even feet (hello sandpit or barefoot beach walk ) that need an emergency clean up from time to time. Those wipes grab your attention with their bright orange packaging & make life easier when you are dashing around the city or are travelling. These wipes contain over 99% natural ingredients, are scented with grapefruit & contain organic tea tree oil, which enhances the zingy fresh fragrance. No less importantly, they are completely biodegradable, which is music to the ears of those of us, who believe in global warming & the negative impact that some of our lifestyle choices have on nature & the Planet we all call home. Smaller sized-ones are perfectly suited to handbags or school bags, as well as for travel or for small accidents, when driving a car, involving food & spilled drinks. 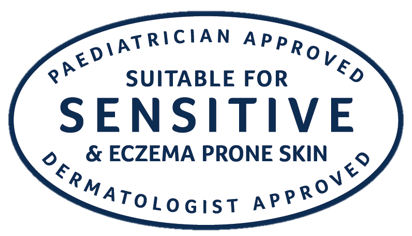 As with all the Childs Farm range, all these new products have been clinically proven to be suitable for sensitive and eczema prone skin, including newborns. CF products are paediatrician and dermatologist approved, so you can use any of them on the most delicate of skin with confidence, whether you are a new mum, a teen, a working woman or a helpful grandmother, looking after her grandchildren. My 9 year-old son suffers from eczema around his hands and in the colder months of the year it gets worse. Childs Farm is the only hand soap which he can use with comfort and he has now ordered that one is left by every sink in the house. We also use the 3 in 1 swim shampoo after days of swimming and apart from its lovely fragrance it rescues the hair beautifully from the chlorine. I would love to see the brand grow with my kids and develop deodorants for children (not teens) and later teen skincare.